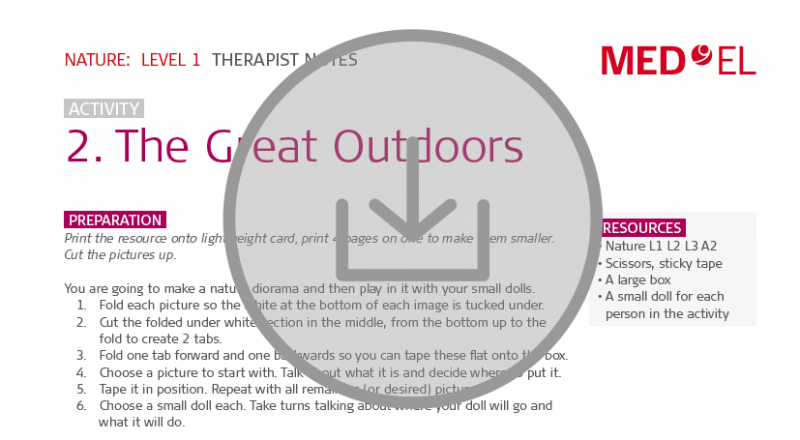 Explore the great outdoors with this month’s brand-new rehabilitation lesson kit! You’ll love getting back to nature with this free comprehensive lesson kit download. There’s more than 50 pages of detailed lesson plans, therapist notes, and nature-themed printable illustrations—download your free lesson kit now! This month, the lesson kit theme is “Nature”. You’ll be using nature-related vocabulary and imagery to build the child’s communication skills. Activities include a questions & answers game, a outdoor-themed diorama, an interactive puzzle game for all 5 senses, and a read-along storybook. Download your free Rehabilitation Themed Lesson Kit pdf now! Don’t miss any of our rehabilitation articles—subscribe now and you’ll get all our latest MED-EL Professionals Blog articles sent right to your inbox.